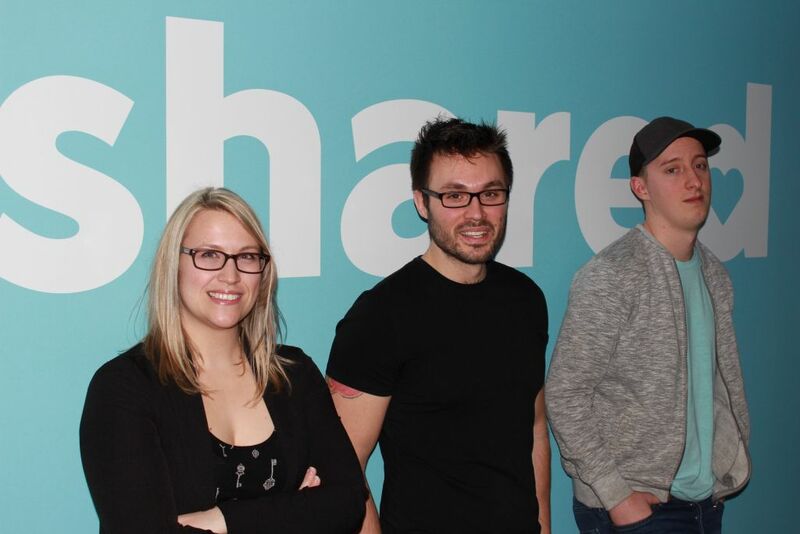 From left, Algonquin grads Bonnie O'Neill, Tristan Worden and Lucas Curson have all put their skills to use working for Ottawa-based lifestyle blog, Shared. At the casually hip offices of popular lifestyle blogsite Shared, the dogs wander under the foosball table where employees can play a friendly game. The casual atmosphere in the basement at 1723 Carling Ave. allows its employees to create content at their own pace for their 30 million viewers online. Shared is home to an online blog that shares articles and videos on a variety of topics including recipes, news and entertainment. Tristan Worden, the head writer, has been working at Shared for five years now. “I’m doing exactly what a newspaper editor would do but I’m doing it online in an office with dogs,” Worden says. Worden ensures his employees can come to him about anything and encourages a calming environment to work in. He is an Algonquin journalism grad himself and was senior editor of the Algonquin Times. “Algonquin really set me up well for this. I am able to write quickly and be very adaptable and I think that’s something that we learned from Algonquin. The industry is constantly changing,” Worden says. At Shared, it’s not like that high stressful environment Worden was so used to when he was interning at Ottawa Citizen. Here, they get to create different content on topics they find interesting. The company’s target demographic is women 35 years and older. The content they want to release is relatable but with a quirky spin on it. Currently, there are 65 employees at shared, with 20 of those employees coming from Algonquin. They have come from programs such as journalism, business development and graphic design. The team currently works in an open-concept basement with desks all lined up beside each other. There’s also room for a dog bed if you choose to bring your pooch to work with you. They also have a giant kitchen to film their food videos. The videos are usually testing out weird recipes, like the famous ketchup and mustard cake, or showing tutorial videos on how to make decadent recipes like ice cream tacos. The videographers get to test these creations, so what do the graphic designers do? Well, any design you see on the website or Facebook is done by the graphic design team. “It’s amazing because you get to really experience what it’s like to work in the industry,” O’Neill says. Bonnie O’Neill has been a graphic designer at shared for almost two years now, and she can’t picture herself doing anything else. A lot of her skill is due to three years of hands-on experience at Algonquin in the graphic design program. There she learned how to do stop motion videography, one of her favourite types of projects. In her last year at Algonquin, she interned at shared and she was doing similar kinds of experiential learning at both school and work. Now O’Neill is making animation videos and designing tee-shirts for their online shops. They sell graphic tee-shirts and mugs with phrases such as “World’s greatest mom” on them. But what does it actually feel like to have millions of views on a video you created? “I see all my friends from all over the place like the stuff from the pages and share them and I’m like, ‘yeah I made that.’ It’s kind of cool to see your work getting shared around,” O’Neill says. There is a lot5 of trial and error when it comes to making a simple 30-60 second video, O’Neill adds, but it is very rewarding to see her video being shared thousands of times only minutes after it is shared. That’s not always the case when they share their new content. Worden says sometimes a video or article just isn’t taken up as well among the viewers as they thought or hoped. The writing team has daily “scrums,” which are meetings to bounce ideas off of each other and discuss what they might write about that day. The writers aim for a conversational writing style and always strive for original content. Shared can be compared to Buzzfeed and Tasty, two other online content creators for how-to videos and bizarre articles. But Shared uses Facebook as their main platform because it’s a good place to reach their main demographic of moms, aunts and grandmas. However, recent changes on Facebook are thought to have led to a decline in the platform’s popularity. Worden doesn’t think Facebook is on the decline but rather that it’s evolving. Algonquin grads find home at blogger’s haven Reviewed by Natalie Oattes on March 2, 2018 .